all measure the impedance spectrum Z*(ω) of a sample material arranged between two or more electrodes. The sample material may be liquid or solid. The measured spectra are further evaluated by the following two research areas. The main interest here is on materials properties - contributions due to electrode effects are typically tried to be avoided. The intrinsic electric material properties like, e.g., the complex permittivity ε*(ω) or conductivity σ*(ω) spectra are easily evaluated from Z*(ω) with the help of sample dimensions. The magnetic permeability spectra μ*(ω) can be determined if the sample electrodes are replaced by an inductive coil filled with sample material. Beyond frequency, electrical materials properties depend on additional parameters, the most important one being temperature. Time, DC bias (superimposed static electrical field), AC field strength and pressure dependence are frequently determined as well. Here the focus is mostly on the properties of electrode/material interfaces. Electrodes are usually made of a meta, the materials are often electrolytes or ion conductors. 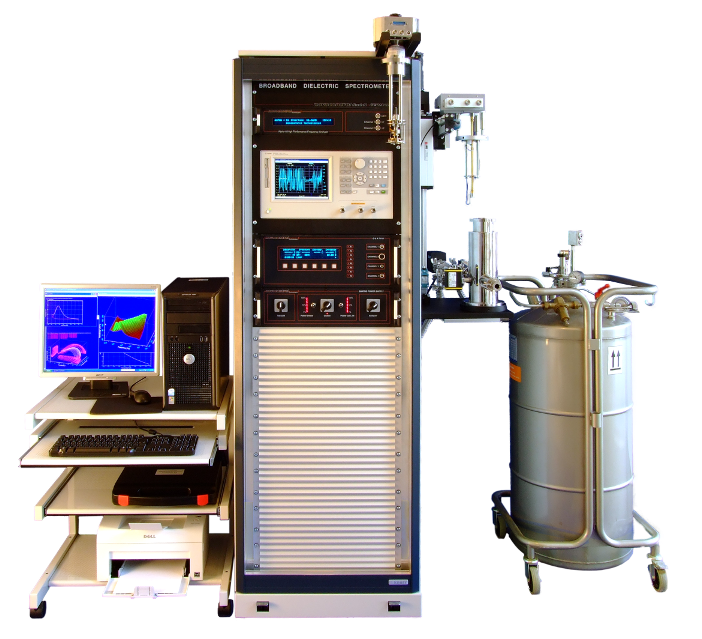 Impedance spectra are typically taken under controlled DC voltage and current conditions. Further details can be found here. 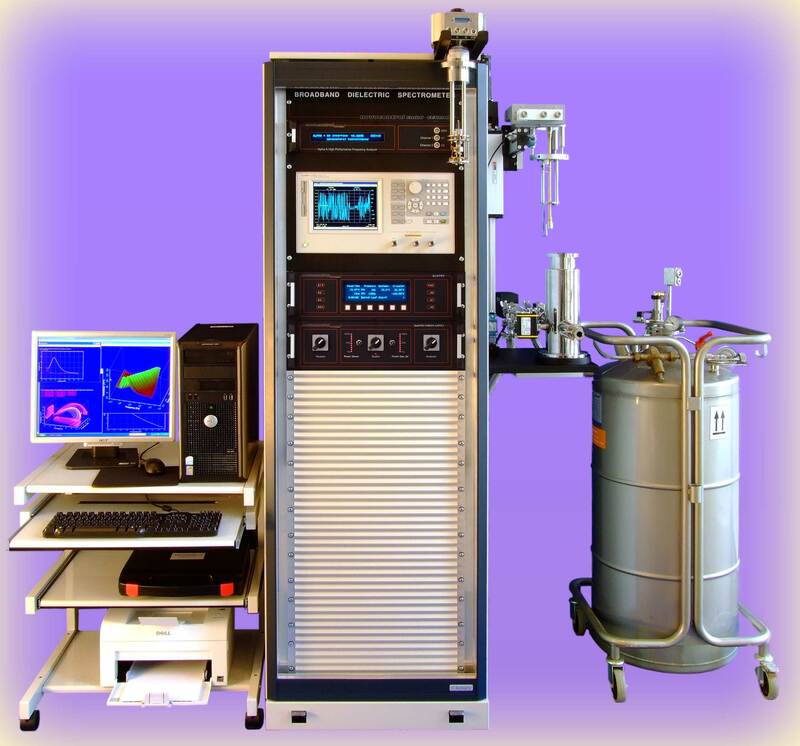 Both for material spectroscopy and EIS, the measured spectra are further processed with special procedures depending on the sample type. Generally, material specific models are matched by non linear curve fitting procedures to the measured data. As the models may include results from other material characterization methods, a link between the several techniques can be established in order to get more general information. Permittivity ε*(ω), conductivity σ*(ω) and permeability μ*(ω) spectra are fundamental material parameters. With modern equipment, they can be accurately and automatically determined from some mHz up to several GHz (15 decades) for nearly all kind of materials. Sample preparation requires only little effort. Equipment costs are low compared to other material analysis methods. The combination of these features make the methods of dielectric spectroscopy, conductivity spectroscopy, and electrochemical impedance spectroscopy both powerful and valuable tools, especially since electrical materials properties are of particular interest both for fundamental and application-oriented research. The method is applied by different scientific communities to various kinds of materials and problems. Although the principle of measurement is always the same, researchers, materials, underlying theories, models and equipment requirements may be quite different.